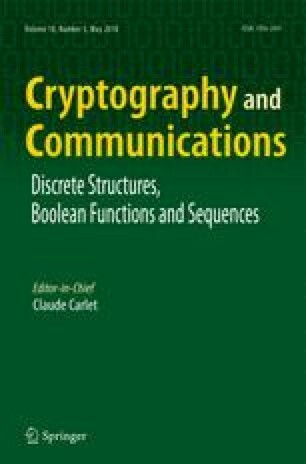 Pseudo-random sequences with good statistical properties, such as low autocorrelation, high linear complexity and large 2-adic complexity, have been used in designing reliable stream ciphers. In this paper, we obtain the exact autocorrelation distribution of a class of binary sequences with three-level autocorrelation and analyze the 2-adic complexity of this class of sequences. Our results show that the 2-adic complexity of such a binary sequence with period N is at least (N + 1) − log2 (N + 1). We further show that it is maximal for infinitely many cases. This indicates that the 2-adic complexity of this class of sequences is large enough to resist the attack of the rational approximation algorithm (RAA) for feedback with carry shift registers (FCSRs). The work is supported by Shandong Provincial Natural Science Foundation of China (No. ZR2014FQ005, ZR2016FL01), Fundamental Research Funds for the Central Universities (No. 15CX02065A, No. 15CX08011A, No. 15CX02056A, No. 16CX02013A, No. 16CX02009A), Fujian Provincial Key Laboratory of Network Security and Cryptology Research Fund (Fujian Normal University) (No.15002), Qingdao application research on special independent innovation plan project (No. 16-5-1-5-jch). The authors wishes to thank the editor and the reviewers for the valuable comments, which make our work greatly improved. Parts of this work were written during a very pleasant visit of the first author to Carleton University in Ottawa, Canada. She wishes to thank the hosts for their hospitality.